It's back! The school is getting prepped up to host the ultimate in frag swaps, the Frag Farmer's Market. I have a great list of sellers lined up including all of the old favorites and a few new faces to bring in some new heat this year. 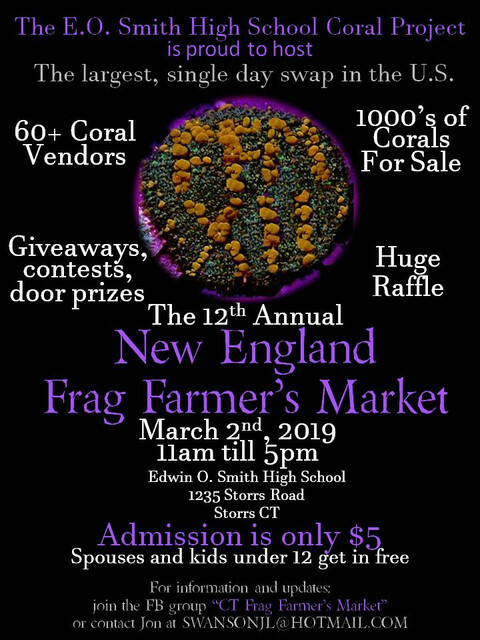 You will not find a bigger selection of corals at any other show, and the set-up fee is so low, the prices are amazing! I'll post more info in the coming weeks. I do have space for more "dry goods" companies, if some of the MR companies are interested in coming up for the day. The price for a table is too good to pass up! Shoot me a PM if you are interested! See you all up at the FFM this year! If you've been we know you will be back and if you haven't you better plan to come!!! I just got word that Caribsea will be supplying the water for the Frag Farmer's Market again. With 60+ coral vendors, all wanting just a little water, that is no small thing! Thanks to Betsey and the crew down at Caribsea for helping out again this year, and for their continued support of the E.O. Smith Coral Project! Thanks for the good word. It is always tough to get people to come out for the first time, (long ride, etc...) but once you come out and see it for the first time, you see what all the buzz is about. I have a pretty awesome lineup of sellers again this year and am still adding "dry goods" companies to make it even better! Okay, lets start with some of the FFM announcements!!! This year, we are going to host something different at the FFM- a celebrity painting session! At 1pm, in one of the classrooms, Rachel Fogle of Reef Weeds is going to be running a painting session for people to come in and do a Zoanthid painting with her. Her paintings are featured all over including on Marine Depot and Amazon! Its like a "Paint and Sip" but without the sip (sorry, it is a school...). You will spend an hour or so with Rachel, painting and at the end of the day, get to take ...your painting home! It's a great chance to have some fun, spend some time with Rachel, and learn a little painting. It would be great way to spend an hour at the FFM for any frustrated artists, bored spouses, etc... Best part- it's free! I only have space, and materials, for 18 people to come paint with Rachel, so the first 18 people who email me at swansonjl@hotmail.com will get a spot. I will make a wait list after that. *We were really thinking of this for adults. Kids are welcome but any kids under 12 must have an adult painting with them. No Snowstorms this year ! !